New category: Thrifty/Nifty. Save some bucks, have some fun. — Long-lived lipstick. With tubes costing $10 and up, plus never being able to find the same shade once you finish one up, who wouldn’t want to make lipsticks last longer? 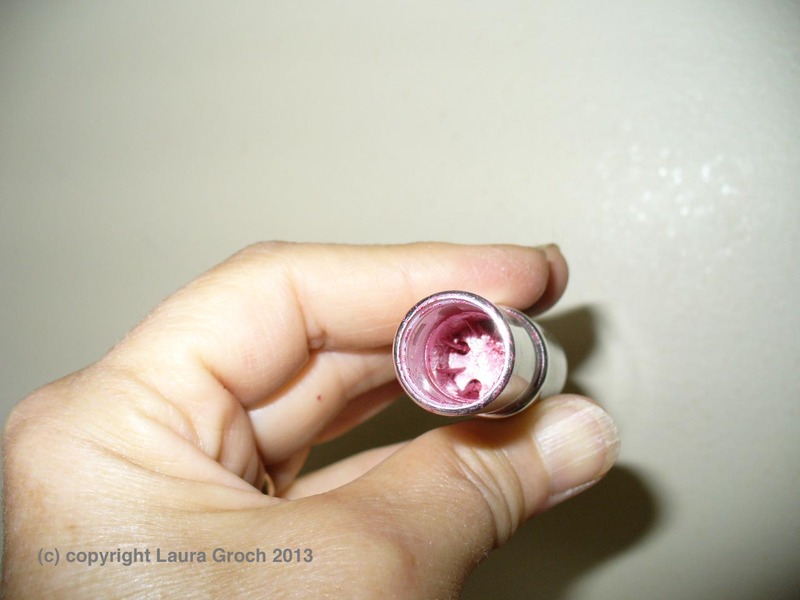 If you toss your lipstick when it’s “empty” — which means it’s now level with the edge of the tube — you are basically throwing away half the tube each time. Invest in a small brush, work it over the lipstick and then apply to your lips. You will be shocked by how many applications are left in the tube — there’s almost as much left inside as there is in a full lipstick. YMMV, of course, depending on brand. (Check out the photo for an example.) Using a brush to get the rest of the lipstick out is just plain smart. And you can keep using your favorite shade a lot longer. — Raccoon eyes. For an inexpensive way to remove the dark smudges left by eyeliner, mascara, etc., under your eyes after washing your face, try a little hair conditioner/creme rinse. I keep one of those hotel-size bottles on the sink and dab a bit under my eyes, then wipe clean gently with a cotton pad or facial tissue. Much, much cheaper than special lotions or creams. — Cuticle pens on the cheap. They’re lovely and fun, but pricey. You can get the same results for a lot less money with your basic tube of lip balm. Just run the edge of it lightly over your cuticles, then massage the stuff in. Presto! A nice pick-me-up for chapped cuticles for a fraction of the cost.